If your an SEO expert of knowledgeable with SEO than you definitely have some initial insight into anchor text and what it is. I could do an entire blog post series on anchor text, what it is and so forth. For the sake of this conversation, I’ll keep this a bit more on topic to anchor text diversity. 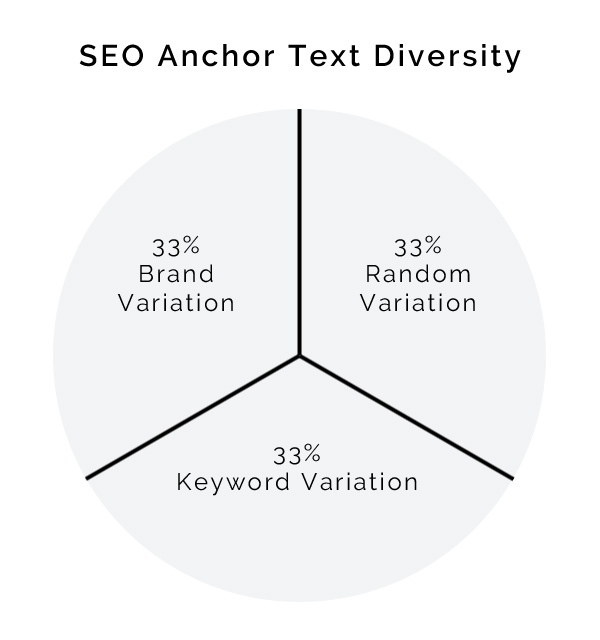 A simple explanation is that anchor text diversity is extremely important to Google and more so, should reflect a natural link portfolio. Long gone are the days where your anchor text for all 10 of your inbound links is “handcrafted pearl necklaces”, because that’s the exact keyword your trying to rank for. So, back to the chart! I instated this rule for myself mostly because it provides more diverse anchor text. Here is how this could look played out. Let’s say my target search is Charlotte Landscaping Company and my company name is StreetScapes, LLC. Note that the concept here is to increase anchor text diversity. The percentages can easily be adjusted based on your specific needs and objectives. Sometimes you may run with an almost exclusive brand focus. This is a good starting point for someone wanting to understand how to incorporate anchor text diversity into an effort.